BioGuard has been helping pool owners keep their pools sparkling clean and free from algae growth for over 40 years. Our goal at Year Round Pool Company is to provide you with the most simple, convenient and effective methods of pool water maintenance. Our quality pool care products and programs are designed to keep your swimming pool clear and healthy. With BioGuard, pool care is easy by using the BioGuard Once-A-Week 3-Step Program for regular maintenance. Stabilized chlorinating product prevents chlorine residuals from being affected by ultra-violet rays of the sun so it stays in the water longer. Can be dispensed in the skimmer or with automatic chlorinator. Super-chlorinate your pool to oxidize undesirable compounds that cause eye and skin irritation and dull water. Regular use will prevent problems from compounds such as perspiration, urine, suntan oil, cosmetics, etc. If you have a white plaster pool, be sure to use Burn Out WP. For all other pool types, use Burn Out 35. Both products help keep pool water brilliant and clear. Preventing algae is much easier than getting rid of it. Stop algae infestations with our highly effective Back Up Algae Inhibitor. Back Up is specifically formulated to work with the other BioGuard products to help prevent new algae growth. 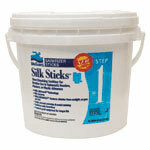 If your pool has an attached spa or fountain, use non-staining, non-foaming BioGuard Algae All 60™ for Step 3.